We seek truth through prayer, through petitioning the spirits in the sacred fire of ceremony. Wings honors the fire, its purpose and effects, in this spiraling coil of flame. 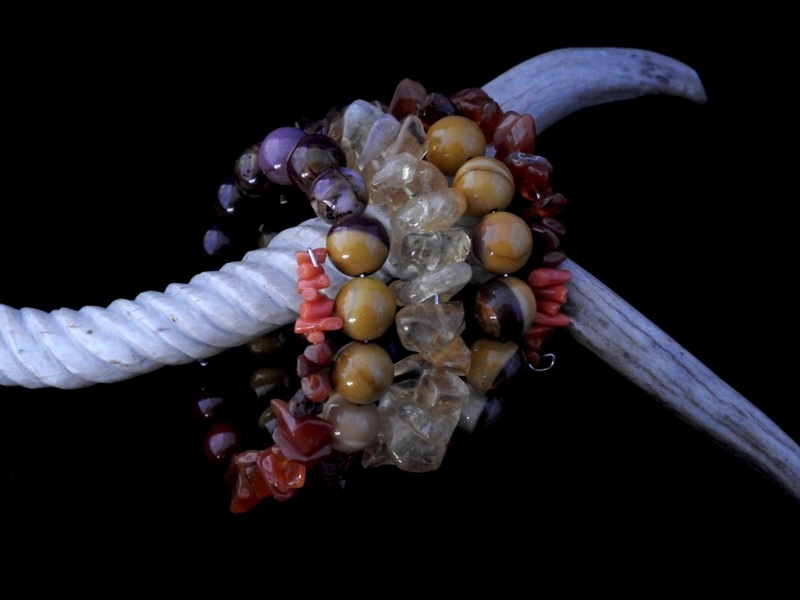 Manifest in the colors of the fire itself, it begins, small and red, with tiny freeform nuggets of angelskin branch coral that extend into larger freeform nuggets of highly polished carnelian. As the flames coalesce in color and intensity, they become spheres of chatoyant red tiger’s eye growing into the diffuse maroon and gold shades of mookaite. The fire concentrates into golden shades, freeform amber nuggets followed by luminous yellow tiger’s eye spheres, finally crystallizing into the pure gold fire of citrine. Memory wire expands and contracts to fit nearly any wrist. Designed jointly by Wings and Aji. Third in The Truth Collection, the final entry in The Seventh Fire Series. Posted on Saturday, December 22nd, 2018 at 11:34 am. Filed under: The Coiled Power Collections, The Seventh Fire Series, The Truth Collection	RSS 2.0 feed.